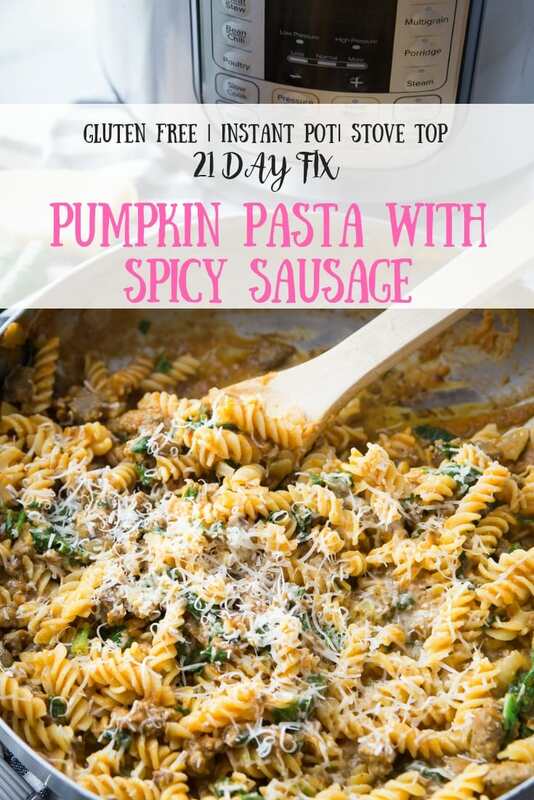 This 21 Day Fix Pumpkin Pasta with Spicy Sausage is the perfect Fall family dinner! 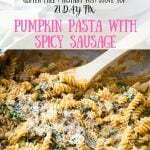 And if you haven’t had a savory pumpkin dish, this creamy and delicious pasta is a great one to try! Confession #102- Halloween is over and I feel like everyone has moved onto Christmas. And I’m over here like what happened to October? Or hell, September? I love the Holiday season, but I just need time to slow down a little bit. I hope you are like me, and still enjoying the beauty of Fall. And I really hope you aren’t over pumpkin yet. If you are, can you make just one exception? 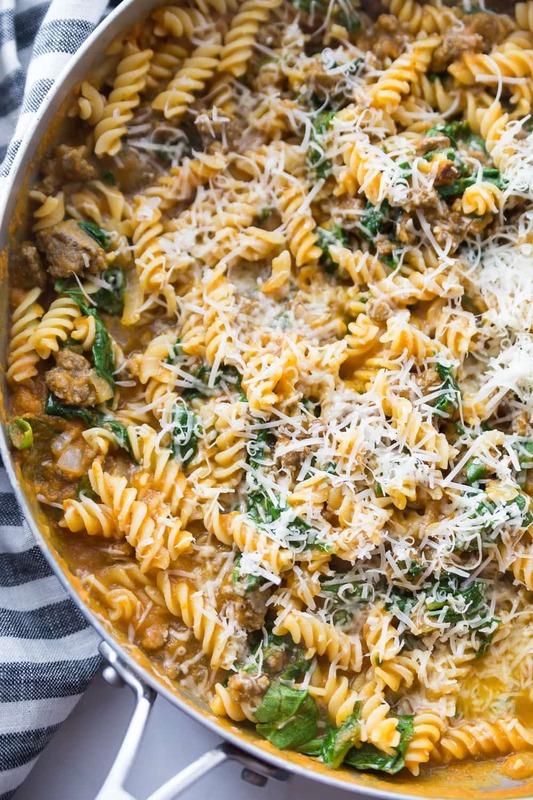 Because this creamy and savory pasta dish just can’t wait until next year. I’m seriously so in love. 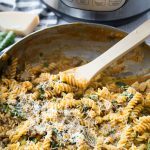 We used our favorite gluten free pasta and kept it dairy free until the end, with the Parmesan topping. You could easily leave it out, though, if you are sensitive like my son and use nutritional yeast instead. The full fat coconut milk gives it such a smooth and velvety texture without the dairy. There is some debate in the 21 Day Fix community about how to count Pumpkin Puree, purple or green. And Autumn counts the canned as purple, but fresh cubes as green. I will tell you that I count it as a green. I don’t claim to be right or to know more than anyone else. Especially Autumn. It’s just what makes sense to me. And I trust the results I’ve had for these kinds of things. The good news is, I added spinach and onions to this dish, as well, so it’s a FULL green. And I gave up two yellows for this, but it was totally worth it. A serving size is nearly two cups and it’s oh so filling. 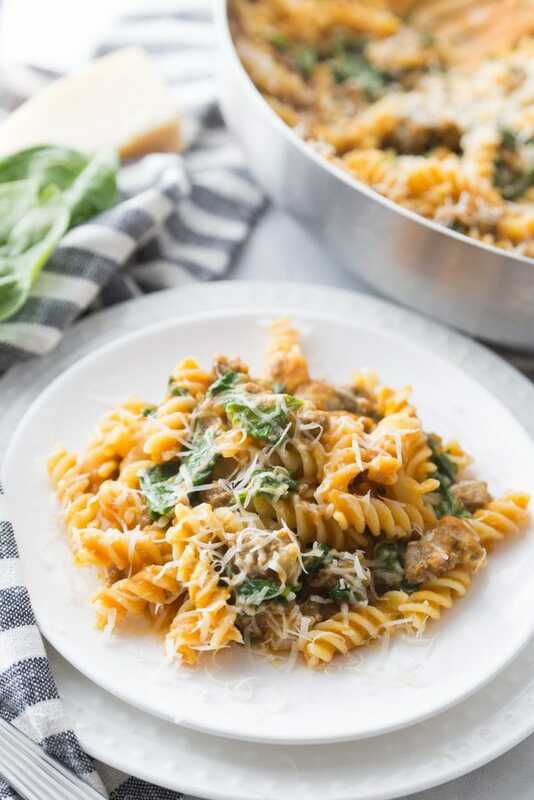 The Spicy Turkey Sausage is the perfect protein paring with the sauce, but I also made the sauce without it (and I left out the spinach, too) and stored it in my fridge. You could even leave it meatless on a Monday if that’s your thing. 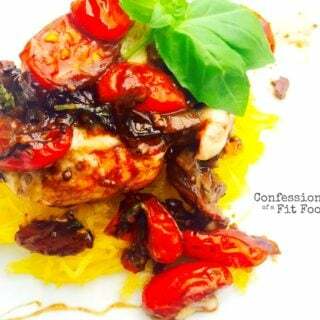 Either way, I hope you love this recipe as much as we do! 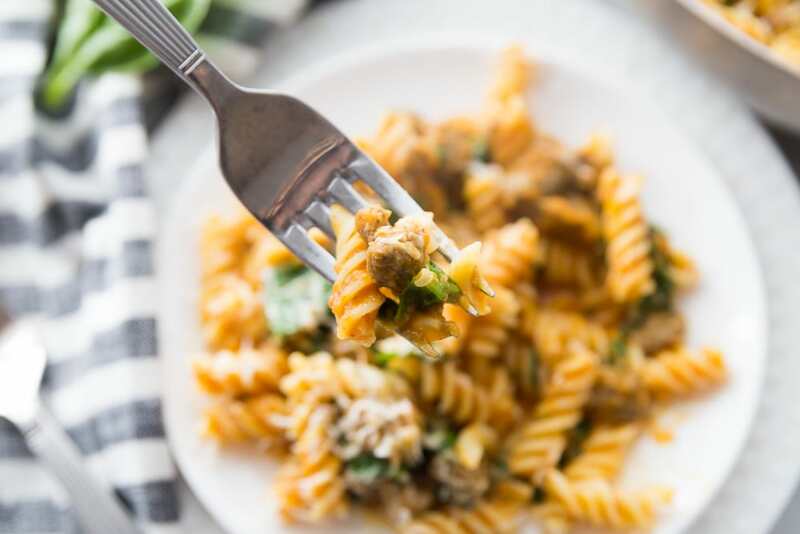 And I’ve recently updated this with Instant Pot directions, and it’s even easier as the pasta cooks with the sauce! LOVE my Instant Pot! 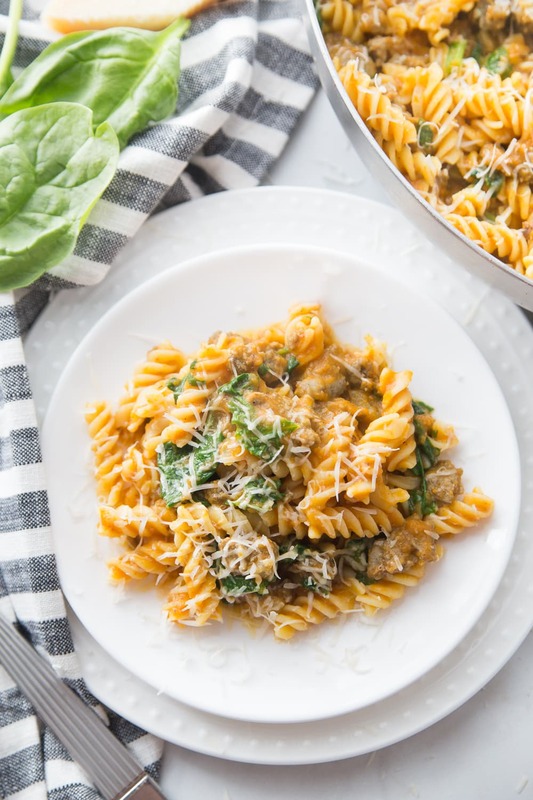 This 21 Day Fix Pumpkin Pasta with Spicy Sausage is the perfect Fall family dinner! Stove top: Remove turkey sausage from casing and brown in a large skillet over medium heat until cooked through. Remove from heat and set aside. Melt butter with oil over medium-low heat, then add onions. Cook until onions are translucent and soft. Add in garlic and cook for an additional minute. Add pumpkin, chicken broth and salt to the onion mixture and stir until well combined. Add in coconut milk and reduce heat to low. Taste and adjust seasoning as needed. 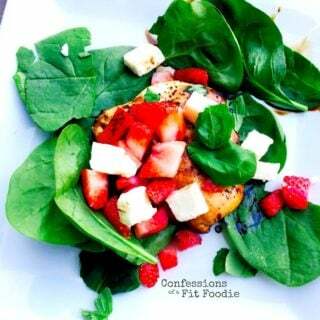 Stir in the spinach and sausage and cook over low heat until spinach wilts. Finally, add in pasta and top with cheese. Enjoy! Instant Pot: Set IP to saute and when it turns to hot, melt butter with oil then add onions, cooking until onions are translucent and soft. Add in garlic and cook for an additional minute. Remove sausage from casing and add to the IP, browning until cooked through. Add pumpkin, chicken broth and salt to the meat and veggie mixture and stir until well combined. Add 2 cups of uncooked pasta. Lock lid and set to manual and cook for 2 minutes. Quick release when finished. After the steam releases and it’s safe to open the lid, stir in coconut milk and spinach, stirring until spinach wilts. Taste and adjust seasoning as needed. Top with cheese and enjoy! This looks delicious! I’m adding it to our meal plan for next week. Thank you for sharing your recipe. It’s never the wrong time for pumpkin, especially not in the Fall. Thank you, Andrea!! I could make this all year long!! <3 <3 Hope you enjoy it!! Pumpkin puree when measured as the puree is a purple due to more pumpkin being in the container. If it is measured as cubes, then there is space in there in between the cubes and that is why it’s a green. That was Autumn’s explanation for why salsa is a purple. Yes – I have heard this. I am happy to still call this a green for me, but totally ok for everyone to make their own decision! I had anticipated being able to taste the pumpkin but didn’t notice it. Any ideas? It really isn’t pumpkin-y…it’s more savory and creamy! This was great but was very soupy. I had to add 1/2 a cup of flour to thicken it up. What kind of coconut milk did you use? Sorry about that – it’s usually very thick when we make it! 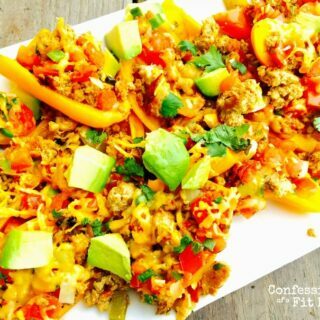 I made this for lunches all week and had a little bit left in the pan to try- OMG! This was so delicious! How can you add so much pumpkin and not have it taste pumpkin-y? I only wish I could find the sage I thought was in my cabinet (I love sage with pumpkin). I cannot wait to eat this the rest of the week. Right? 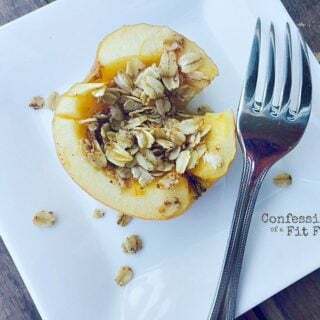 I know – pumpkin is so versatile! And yes – sage would be delish with it for sure! You can see how you like it without! Another idea would be to sub nutritional yeast! 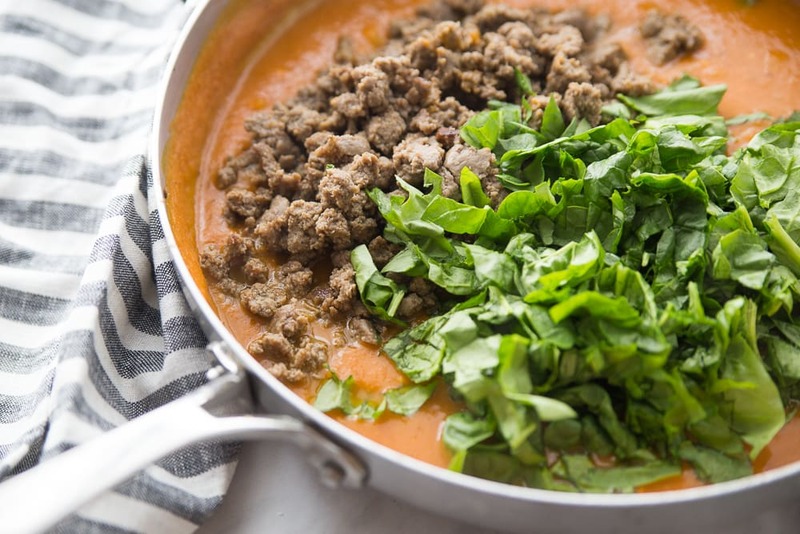 Would this be okay with Sweet Italian Sausage instead of Spicy? Also, how much nutritional yeast would you use? P.S. 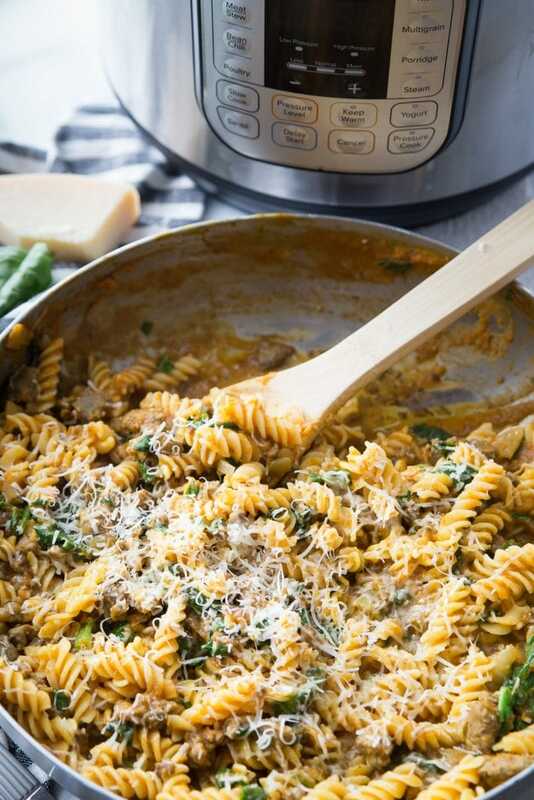 I’m loving your Instant Pot recipes! Yes!!! I would start with 1-2 Tablespoons and see how you like the flavor! Yay! Fellow year round pumpkin lover here!